With Halloween coming soon (well, 86 days away), I've had monsters on the brain, so I've made a couple monster skulls for you...one for this week, and one for next week. I even plan on becoming a monster for Halloween, but that is for another post that is closer to Halloween. This lovely lady, is of course the iconic Bride of Frankenstein. When I think of female monsters, this is the one that I immediately think of. The Bride/Mary Wollstonecraft Shelley, aptly named after the author of "Frankenstein" or "The Modern Prometheus", is played by Elsa Lanchester. She has stiff tall hair which is a result of her life giving electrocution. In this piece, I've portrayed her as post mortum (post post mortum? ), but with hair intact as if her body bandages had mummified her hair some how or maybe her hair is just that impressive, that it needs to stay. The choice of black, white and gray are of course because the movie is a black and white movie, which are my favorite kind. Despite having color TVs in my household as a youth, I always preferred to watch TV on my mother's old black and white TV...you know, the kind with the rabbit ears, that only gets a few channels. Granted, I was watching mostly regular shows, occasionally I could watch old ones, and that unified the nostalgia of the black and white tv experience. Since we are on the topic of old movies, what is your favorite old movie? There is no tutorial for this one. 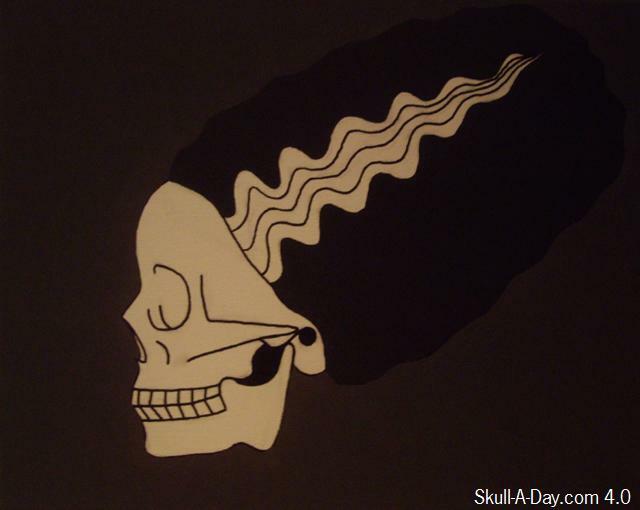 I used acrylic paint, a medium paint brush (for the grey background and black hair) and a black paint pen (for the skull and waves of the hair). If you haven't considered using a paint pen in your paintings, I recommend it. You get better control of lines and details. I've used them for various paintings and am always pleased with the easy of use and result.